Did the Utah Legislature do the right thing by overriding the medical marijuana initiative? Poll shows voters are divided. (Jeff Chiu | AP file photo) In this June 21, 2018, file photo, a laboratory manager holds a cannabis sample in Oakland, Calif. A new Tribune-Hinckley poll suggests that slightly more than half of registered Utah voters support the Legislature's decision to replace Proposition 2 with an alternative medical cannabis bill. 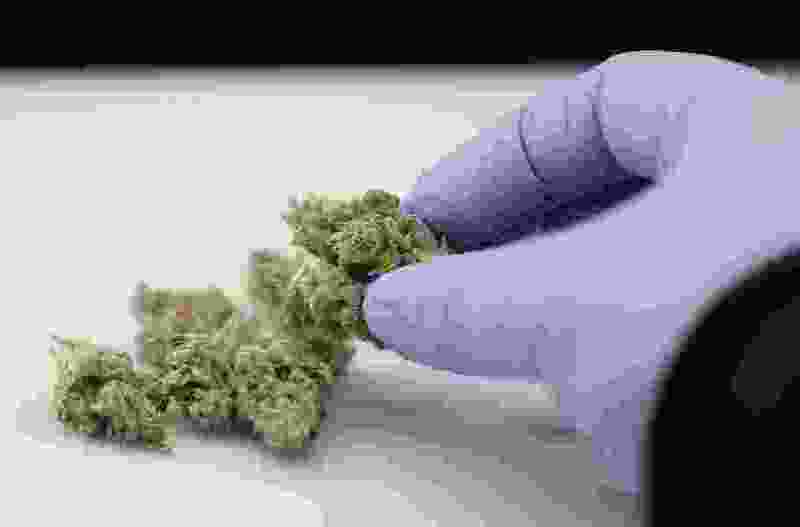 The Legislature’s decision to overwrite the medical marijuana initiative with a bill of its own making enraged some advocates and patients, but a new poll suggests voters are more inclined to sanction the substitute. Fifty-one percent of those surveyed in the The Salt Lake Tribune-Hinckley Institute of Politics poll said they supported the changes made by lawmakers during a December special session, held a couple of days after Proposition 2 took effect. The Utah Medical Cannabis Act — which flowed from an agreement struck by state heads, advocates and The Church of Jesus Christ of Latter-day Saints — established a more restrictive system for dispensing the plant-based substance and deleted some of the medical conditions that would qualify someone for the treatment. The results of the mid-January poll counteract the idea that lawmakers were trampling on the public’s will by amending the cannabis initiative, says former House Speaker Greg Hughes, one of the bill’s architects. "Those numbers, I think, are encouraging," Hughes said. The message conveyed by the survey results was a little different if you ask Connor Boyack, a medical-cannabis advocate and founder of the libertarian Libertas Institute. Forty-one percent of respondents said they oppose the replacement bill, so the poll points to the controversy surrounding Prop 2 and the legislation that superseded it. "While we ended at an agreement that everyone could live with enough to move forward with, more work remains to be done," said Boyack, who helped write the replacement bill. With the ink barely dry on the new cannabis law, legislators have agreed to hold off on making amendments in the current session, he said. So while Boyack supports Rep. Marsha Judkins' proposal to add autoimmune diseases as a qualifying condition for medical cannabis, he doubts it will have success this year. In coming years, voters will likely see changes aimed at making the cannabis program more robust and less bureaucratic, Boyack said. Christine Stenquist — a vehement supporter of Prop 2 and part of a lawsuit seeking to overturn the legislative substitute — argued the poll question skewed the results by sugarcoating the changes made through the replacement bill. The new law effectively turns government employees into members of “a cartel” by setting up a state-run system of distributing cannabis, a substance illegal under federal law, she says. In her view, lawmakers have hoodwinked many Utahns into believing the new medical marijuana program will be functional. Jason Perry, director of the Hinckley Institute of Politics at the University of Utah, noted that the poll indicates most people are familiar with the history of the cannabis debate, with only 7 percent saying they didn’t know enough to express an opinion. Everyone else went one way or the other on the issue, with rifts opening based on partisan and religious ties. For instance, the more restrictive cannabis replacement bill was popular among Republicans and active members of the LDS Church but was generally unpalatable to Democrats and other religious groups. "The issue of medical marijuana was contentious and divisive as it went through the process, as it went to voters, and it remains an issue dividing Utahns," Perry said. Earlier polling showed a majority of Latter-day Saints were supportive of opening access to medical cannabis in Utah, but they cooled on the ballot initiative after the state’s predominant faith came out against it and got behind the alternative. Hughes said the numbers hint at how ugly the battle around Prop 2 could’ve gotten if lawmakers, advocates and Latter-day Saint leaders hadn’t struck a bargain in October. Poll respondent Rachel Hamilton said she wished the Legislature had left Prop 2 alone, since the initiative was crafted by medical-cannabis advocates and passed by Utahns. “It’s ridiculous that they [lawmakers] thought they were above the people, and in my mind, they broke a law,” said the American Fork resident, adding that she voted for the initiative. Voter Todd Blomquist, on the other hand, wishes Prop 2 hadn’t passed in the first place and believes the state would be better off without a medical-cannabis program. But after the initiative’s passage, Blomquist said he’s glad the Legislature swooped in to adjust the measure. The survey was conducted by The Salt Lake Tribune and the Hinckley Institute of Politics between Jan. 15 and Jan. 24 and had an overall margin of error of plus or minus 4 percentage points. The 604 respondents were all registered voters contacted by phone and online.